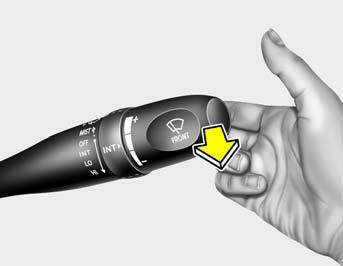 To use the windshield washer, pull the wiper/washer lever toward the steering wheel. When the washer lever is operated, the wipers automatically make three passes across the windshield. The washer continues to operate until the lever is released. o Do not operate the washer more than 15 seconds at a time or when the fluid reservoir is empty. o In icy or freezing weather, be sure the wiper blades are not frozen to the glass prior to operating the wipers. o In areas where water freezes in winter, use windshield washer antifreeze.